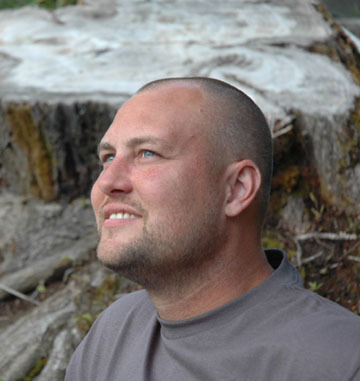 Hi, my name is Jeff Nelson, owner and operator of TreeCycle Northwest. As early as I could swing a hammer, I have been intrigued by building and construction, stemming from a family of wood carvers, boat builders, homesteaders, and farmers. Woodworking and building has been in my family and inherently in my blood. As a kid I built forts, go carts, and did wood engravings. By my early twenties, I set up a woodworking shop in my garage, worked in custom furniture shops, cabinet shops, framing contracting firms, and up until starting TreeCycle NW worked for a custom fence and deck company. We were building a fence in a housing development just outside of Washougal Washington. I had seen a couple logs laying on the ground. A light came on and I decided to take a closer look. As I peeled off a piece of bark I discovered white oak. The same wood I had been buying all those years as a woodworker. My heart started to beat a little faster as I scratched my head and tried to wrap my mind around what to do next. I had a conversation with the developer and found out that he wanted “to get them gone.” I proceeded with buying an old chainsaw and milling attachment, and milled the logs on-site. Then brought the lumber home to dry, eventually turning it into furniture. It was where I found my passion and TreeCycle Northwest was born.